And if you ask Yamada, who runs Yamada Technical Research Advisors, oil prices are facing some serious resistance that can't be topped without similarly strong support. "Right here, $60, $60-61, is an important support on any pullback," Yamada told CNBC's "Futures Now" on Thursday. "I'd like to see that hold if we're going to see a consolidation that suggests higher levels. So, let's say $60 is an important support." At the same time, crude is bumping up against resistance at the $64 level, which it failed to hold in Friday's session. "So far, oil has achieved our first target of $63 and, at the moment, it's gone through the 200-day moving average, which is a plus," Yamada acknowledged. "But it's headed up into this 2018 resistance level — that's almost a yearlong resistance — so I would suspect that we get a little consolidation. It could pull back toward the 200-day [at] $61.60." 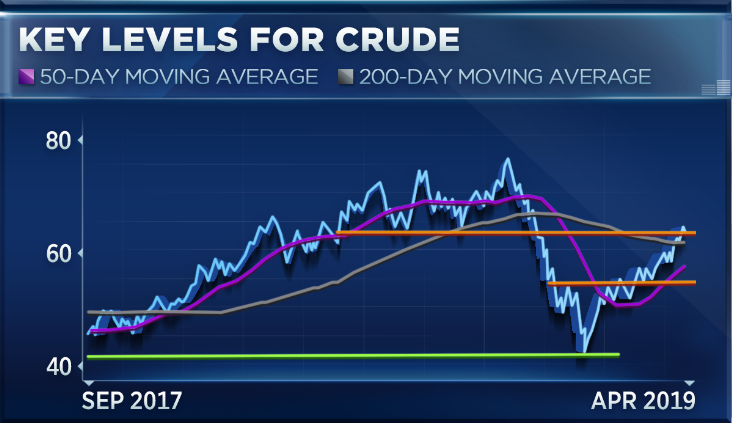 If the stars align — crude's 50-day moving average crossing above the 200-day moving average at the same time as the price moves above $65 a barrel — Yamada gets more bullish. "We have an outstanding target at $70" if those two things happen, she said. "But our real concern here was the resistance around $63, $64. So we want to see how it negotiates that level. We did have a nice positive divergence in the daily momentum back in December, suggesting that the low that we saw was a reversal, which we got. [...] So this may be a resting point before, and if, prices go higher." And while crude's daily and weekly momentum indicators are still positive, "it's the monthly that concerns us," Yamada warned. "It's close, but has not moved into a positive position. If it did, then I think, possibly, you could see it move higher. But at the moment I think it's due for a little bit of a rest." WTI crude oil prices ended Friday's trading session fairly flat, up less than half of 1%. On Thursday, RBC Capital Markets raised its 2019 forecast for international Brent crude, the global benchmark, to $75 and forecast bouts of $80 crude throughout the summer.